In the first two articles in this series I discussed the process of configuring the LeftHand VSA and preparing a volume for attachment to a VMWare server. A few things should be noted here. -Since I’m working in a test environment I am keeping the ISCSI traffic on the same subnet as the Virtual Machines. The VMKernel is the interface in VMWare that needs to see the ISCSI traffic so to keep this simple I will leave everything on the same subnet. Remember ESXi is different than ESX as far as the network configuration goes. We really aren’t looking at performance right now, just trying to get the VSA up and running so we can play with it. So basically all I need to do at this point is enable the ISCSI software initiator in ESXi and give it the information it needs to find the ISCSI LUN we created. 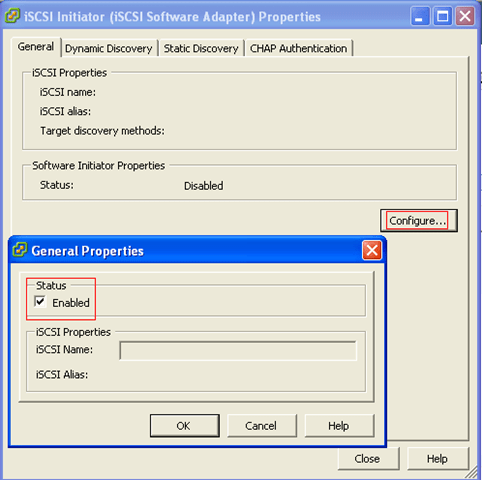 Under configuration in your VI Client click on “Storage Adapters” and then scroll down in the right pane until you see “ISCSI Software Adapter”. Select it by left clicking on it and then choose properties in the lower pane. On the properties click the “Configure…” button and check the box under status that says “Enabled”. Note you cant insert your own ISCSI name at this point. 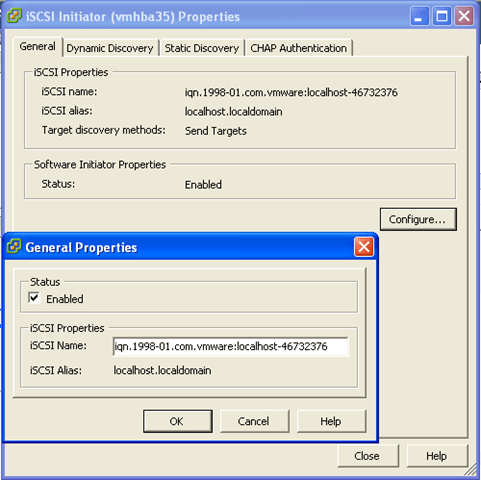 Once you press OK the system will think for a brief moment and the populate the “ISCSI Properties” section at the top of the Properties page. Additionally if you click on “Configure…” again you are now able to edit the ISCSI name, however I wouldn’t recommend doing so unless you know what you are doing. You can now continue configuring the ISCSI connection. Select the “Dynamic Discovery” tab from the top of the Properties window. Underneath “Dynamic Discovery” click the “Add…” button from the lower part of the screen. On the “Add Send Targets Server” window enter the IP of your LeftHand cluster. Please note here DON’T USE THE IP OF YOUR LEFTHAND NODE. You have to use the cluster IP. I know it doesn’t make a lot of sense since we are only working with one node but you have to think of situations where you would have more than one node in a cluster. Leave the port value at its default setting of 3260. Now click on the “CHAP Authentication” tab of the properties window. 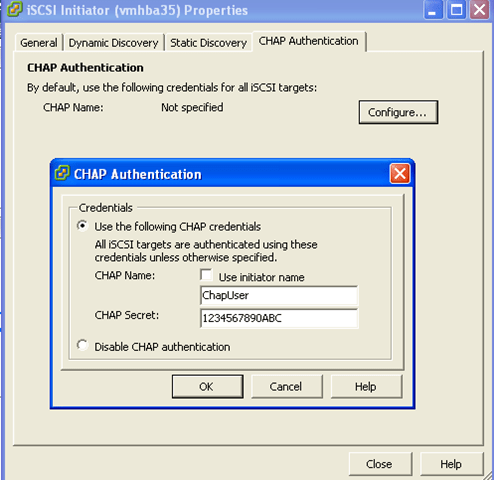 If you prefer to not use CHAP you could very easily go back to the “General” tab, copy the ISCSI name, go back to the LeftHand CMC and change the server definition to “CHAP not required” and paste the name you copied in the “Initiator Node Name” text box. We simply configured CHAP in the previous step because we didn’t know what the ESXi Initiator Name would be at that point of the configuration. If you choose to do not use CHAP and make the above listed change disregard the next step where we configure the CHAP authentication. Click the “Configure…” button and enter in the credentials you specified when you configured the server in the LeftHand CMC. Once done press “OK”, and then close the Properties window. After you press CLOSE, VMware will ask you if you want to “Rescan the Host”. Choose “Yes”, this will rescan all the HBA (Host Bus Adapters) on the ESX server. With any luck after the HBA scan completes you should see the volume you created in the LeftHand CMC appear as an available LUN. If you don’t see it verify the CHAP username and password you used and make sure you are matching the correct password that you defined in the LeftHand CMC. You had to define a Target and an Initiator Secret which had to be different. Ensure you are matching the correct Secret and then try hitting the “Rescan…” button at the top of the Storage Adapters pane. 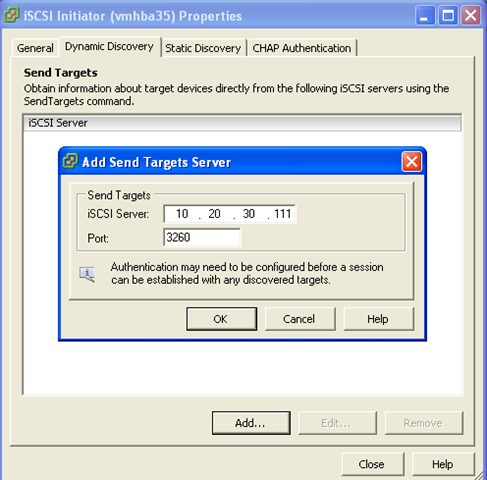 The Windows ISCSI Initiator lets you do mutual authentication which would use both the Initiator and Target Secrets. Now if we select Storage from the “Hardware” area on the left hand side of the screen we can see our existing datastore. To see the ISCSI datastore we are going to have to add it. Select the “Add Storage…” link from the right side of the screen. This should bring up the “Add Storage Wizard”. Ensure that Disk/Lun is selected and press NEXT. 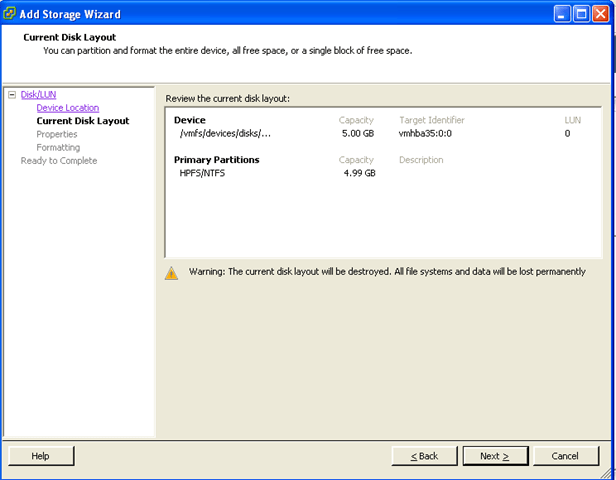 The next screen warns you that the current Disk Layout will be destroyed. Note in the below image that I had used this LUN for a quick test on a MS Server and formatted it as NTFS. 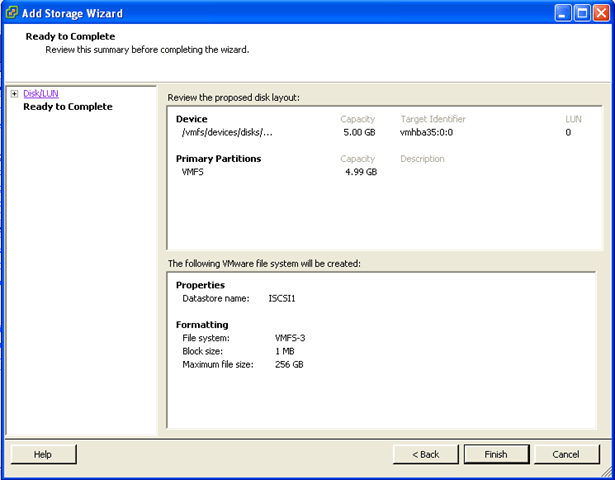 The wizard picks up on that and warns that the disk layout will be destroyed. Press NEXT. On the next screen give the datastore a name and then Press NEXT. On the next screen choose how big you want to make the datastore. Most of the time I would just leave the option “Maximize Capacity” checked. That will use all of the space on the LUN and is the default setting. The other option on this screen is Maximum Block Size. There are a couple different schools of thought on this and if you aren’t sure I would recommend the default settings. After it finishes creating your VFMS Datastore, the new datastore will show up under storage where you can start treating it just like any other datastore. That’s it! You’ve successfully implemented a completely virtualized SAN solution! Great piece you have made here! The internet is stuffed of horrid authorship and I was grabbed by your pellucidity. Your endings are correct and I will immediately subscribe to your rss feed to stay up to date with your up emerging postings. Yes! I admit it, your penning style is exceptional and i need to improve on mine unquestionably. Thanks for reading! I really enjoyed writing the LeftHand articles. Its a great piece of hardware. If you havent tried out the CLIQ give that a try. You can do some really neat stuff with both the LeftHand and Windows Scripting engines!